Pat Aust’s love affair with Redondo Beach has spanned 46 years serving on its fire department, city council, and historical society. He’s not done. One day in 1970, a young electrician who worked for the city of Redondo Beach found himself circling the parking lot of Redondo Union High School. But at this moment, as he circled and circled, the quick-tempered Aust had had just about enough of the school’s parking lot. He’d arrived back at RUHS in order to join 340 other applicants testing to become a firefighter for the Redondo Beach Fire Department. He was about to abandon that plan. As Aust drove toward the exit, a car backed out of a parking spot in front of him. Aust pulled in and took the test. The rest is 46 years worth of one man’s history with the City of Redondo Beach — and proof that, as he said, “it’s those little things” that make the difference in life. Aust was born in 1948, in Hermosa Beach. “Eight houses out of Redondo,” he said, somewhat ruefully. 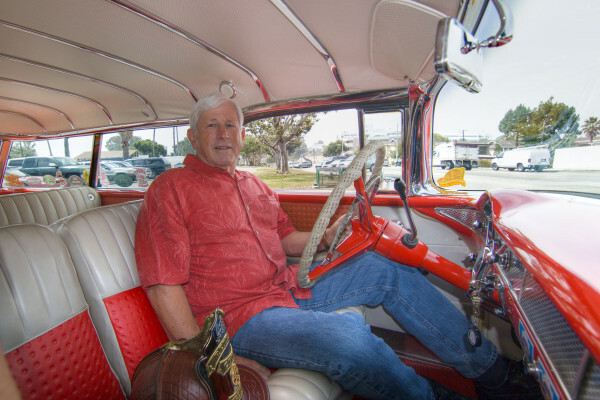 He attended Hermosa’s elementary and middle schools and grew up surfing and falling in love with hot rods. He was instilled with a strong work ethic by his father. “He beat it into my head,” Aust said, “figuratively more than physically.” By his senior year at Redondo Union, he was running a grocery store night-stock crew, and at age 19, he had already obtained his journeyman electrician’s card, working construction for TRW. “When he got into something, he was in it one hundred percent,” Linda said. While he was installing wiring, his wife was working for the city’s doctor, and learned that a number of prospective electricians for an open job with the City of Redondo Beach were turned away for having bad backs. “I said ‘I know an electrician, and he doesn’t have a bad back,’” she recalled, laughing. So, with the encouragement of his wife and officials at the city, Aust applied for the job. At that time, the city needed at least three qualified applicants to test at the same time before hiring the best of the pool — since Aust was the only qualified applicant, they hired him “pending examination,” hiring him full-time nearly six months later. The next year, Lillian Lord, a longtime city employee, took Aust aside and recommended that he take the exam to become a firefighter. “My son-in-law is applying for the job, and I think you should try out for it too,” she told him. He was hired soon after completing the exam, rating second out of the 340 applicants in the agility test, and began working in April 1970. Looking back, Aust takes a great deal of satisfaction in his job, saying that he’s directly responsible for saving more than a dozen lives during his time with Redondo Beach Fire. Decades removed, however, Aust also clearly remembers the bad days. Such as May 27, 1987, Memorial Day weekend. A battalion chief at the time, Aust was the first on the scene to an apartment fire near Beryl Street and Prospect Avenue, with purple-tinged flames shooting up from the building, the mark of an accelerant. A later investigation showed that the fire was an act of revenge taken against a man who’d made enemies of some high school football players. Though he lost his apartment, the man made it out alive. The people in the apartment above, two flight attendants and a boat captain, weren’t so lucky. Their way down the stairs was blocked by the fire, leaving them trapped. “I’m the first there, and I hear these screams….” Aust remembered. “I look up, and there were these hands above the fence. The fire was boiling…they were cooked,” he said. “It’s 3:30, maybe 4 a.m. As we put the fire out, a car comes by, I’m standing at the radio, and I see my daughter waving at me,” Aust said. His daughter, Jennifer, was on the way to the Colorado River with two friends, leaving in the middle of the night. Linda Aust remembers that weekend clearly as well. “I told them to get a good night’s sleep that night, that they shouldn’t drive tired,” she said. Her advice went unheeded. The driver, another passenger and Jennifer Aust all fell asleep. The car went off of the side of the road near Twentynine Palms. Aust still remembers the call coming in over the radio as he stood at the scene of the apartment fire. He chokes up, fighting back tears. He and Linda arrived to find Jennifer cut and bloodied, but alive. The car she and her friends were riding in was an older model without seatbelts, her saving grace. The roof above her seat, on the car’s front passenger side, was compacted in, crushed when the car rolled off of the road. Without a seat belt tethering her she was thrown into the back seat and survived alongside the other passenger seated in the back. The car’s driver, however, was partially thrown and crushed by the car, dying that night. In 2003, Pat Aust retired as Redondo’s Fire Chief. During his tenure with RBFD, he became the youngest captain and youngest battalion chief in the department’s history. Redondo Beach City Attorney Michael Webb began with the city 21 years ago. While he’s quick to cite the work and the programs Aust has championed, the former chief’s accolades don’t come first in his mind. Aust wasn’t afraid of contact on the dais, regularly laying into anyone who dared to show up not prepared to his liking, such as Dr. Greg Allen, founder and director of South Bay nonprofit Freedom4U. Allen, at the Jan. 6 City Council meeting, came to the meeting requesting that the city waive usage fees for a concert at the Redondo Beach Performing Arts Center. When Allen tried to answer a question of how Redondo Beach students would be involved by estimating the number of parents in attendance, Aust cut him off. “I didn’t ask you how many would be in attendance, I asked how many would be performing. You don’t expect the parents to get up there and sing, do you?” Aust asked, eventually casting the lone vote of dissent against the concert. Aust clearly didn’t enter the political fray to win a popularity contest. He says that he got into government to help people understand government — to dispel the notion that money can be spent “wherever you want, however you want,” believing that it’s wrong to waste the city’s money. That love, shared by his wife, led to a massive collection of Redondo Beach memorabilia, including more than 4,000 photos of the city throughout the years, and the helmet of the very first Redondo Beach Fire Chief. The two are active members of the Redondo Beach Historical Society; he formerly served as the organization’s president. On Tuesday, June 2, Aust left the dais of the Redondo Beach City Council Chambers for the last time as a representative of District Three, and stood before a packed audience, microphone in hand to make a final statement. With his wife, his daughter, his son-in-law and his newly-received Key to the City beside him, he quipped that they “took away the real keys” before giving him this award. Aust nearly missed his opportunity to join the Fire Department — but he saw his chance and took it, leading to what will be half of his lasting legacy. “He’ll always be ‘Chief’ to me,” Aspel said.